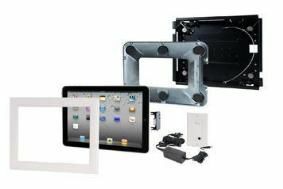 iPort introduces in-wall docking system for iPad | What Hi-Fi? It allows an Apple iPad to be used as an in-wall touch panel control, providing continuous charging of the iPad and connection to a local wi-fi network. Once installed with a vareity of downloadable applications for home automation control, the iPad can be used to operate audio, video, lighting and climate systems. "When mounted in the CM2000, theiPad home button remains accessible, and the power button is cleverly replicated on the outer edge of the CM2000 frame," says Ashely Hutchinson, sales manager for iPort at Armour Home, which distributes the product in the UK. The CM2000 costs £500 and comes with a magnetic bezel assembly, mounting frame, connector and charging board with RJ-45 connector, power wall plate and power supply.